Lost some – Some how things magically disappear, if you know what I mean. It’s a pain when you need a specific hook for a pattern, and you just don’t have it. When I want to crochet something, I want to crochet it then and there, not a day later after I go to the store to get the right hook. Broke one – Argh! I hate this. It’s one thing to not start a project because you don’t have the hook, but it’s another thing to end in the middle of a project because the hook broke! Needed a plastic one to go on the plane – Just to be on the safe side, plastic or wood hooks are preferred on airplanes compared to metals hooks. I sure don’t want my crochet hook confiscated because someone thinks it’s a weapon. Now I’ve learned to have “back up” hooks. One set of hooks is aluminum, the material I like to crochet with, and the other set is plastic, great for traveling with on a plane. Then there are the tiny hooks I use for thread and the giant hook I use with bulky yarn. To date, I have about 20 crochet hooks. How many crochet hooks do you have? This entry was posted on Friday, October 23rd, 2009 at 3:27 PM by Rachel Choi	and is filed under Fun Ramblings. You can follow any responses to this entry through the RSS 2.0 feed. You can leave a response, or trackback from your own site. How Many Crochet Projects Are You Working On? Definitely not enough. I am getting back in to crochet after too many years away. They definitely offer very cool colors now. I prefer the Susan Bates hooks. They flow smoothly. The Boye hooks seem to split my yarn. I gave a whole set away because I couldn’t seem to get the hang of them. I found the Susan Bates and I felt like I was in heaven. Of course, one of my girlfriends is the exact opposite. She juist doesn’t understand how I can use the S Bates hooks. love the Susan Bate hooks too!! I have 30 hooks. aluminum and steel. Can never have enough hook around. I have a set in each car for travel and 2 in the house (30 hooks). Never know where I’ll start a project have to be ready. I like both Boye and Susan Bates. I have to agree that Susan Bates hooks to work better. Several of my friends feel the same way–that I’m crazy to have so many hooks! But…then… they lose one, and are grateful I have extras!!!! Never enough! I have all the aluminum hooks, now replaced by those with bamboo handles; one size 7 steel hook with the warmer feeling bamboo handle. I also have many of my grandmother’s steel hooks, some from Boye and Susan Bates marked 10 cents or 15 cents. Have they ever changed the sizing of hooks? I have no wooden or plastic hooks…yet. I bet I have over 100 hooks. When my aunt passed away, her boys gave me her hooks. I love the new colors and materials thay make hooks from now. I buy new ones when I’m on a trip or just out shopping. And when ever I see one while at a second-hand store, I buy them also. I agree you can never have enough hooks . I have the aluminum hooks, some light up hooks (have you ever tried these they are great in a darker room when everyone is watching movies and your crocheting LOL) Bamboo , wood , and a few plastic . I leave them in project bags and someone is always asking me to teach them to crochet so I lose a few to new crocheters. I even have a few that have beautiful clay designs on the handles they are easier on the hands if you crochet for long periods of time . I have 15 hooks – some of which are duplicates. They are Boye hooks, but I have recently read from quite a few different gals that they highly prefer the Susan Bates … so I plan on buying Bates hooks. I’ve been crocheting for a little over 1½ years and thought that when my yarn split, it was because of the yarn itself – never imagined it was ‘cuz of the hook! I love the aluminum. Haven’t tried any with bamboo handles – or aluminum hooks that also have bamboo on them. I am thinking the extra width of bamboo, partially up on the aluminum, would be too thick and get in my way. I have only a little over 10 right now. I’m slowly building up a collection as I need them. Right now, I pretty much exclusively use an aluminum G hook. G is the most common size for amigurumi, which is the majority of my crochet projects, but it’s also the “just right” right in the middle size for blankets and scarves. I “borrowed” most of my mom’s old hooks since she stopped crocheting for years so I have her D, F, H, J, K and N hooks. I had to buy a G because I dislike plastic because it’s too bendy for me. Fortunately my mom likes her plastic G hook better so there’s no fighting over G hooks. I have 2 extra plastic G hooks that a friend gave me because she gave up on crochet, and I bought a Q hook and an afghan hook for special projects even though I haven’t used them yet LOL. I haven’t lost or broken a hook yet, but I’m always at the craft store and have coupons all the time so I can just buy them as I need them rather than stock up. I have a lot of the aluminum sizes, with multiple G’s and H’s. Bamboo handles are good, I made sure to get my two steel hooks with them. I do have a pair of plastics, and it was ok to use them but I still like the aluminum better. One is my S hook though, and that would be bad to have in metal! I didn’t know the airlines could confiscate my crochet hooks!! That would definitely ruin my trip. I’m running right out to get wooden hooks!! Thanks! I have 16, one set of aluminum and one set of Soft Touch. I’m looking to get some larger hooks at the moment, I need some larger hooks. And my mom’s been begging for me to make doilies, so I’m going to have to look into getting some steel hooks. But I’m going to wait on that. i have 3 bamboo,34 plastic,and 108 aluminum and one of eah of the crochet lite(love them) i counted them (i worked at walmart for 5 years and never had a hook with me so i would buy new hooks and some yarn on break just cause i had an idea ….. I have the very same problems as Lanet (and I thought I was the only one that had hooks in different bags, several projects going!) I’m notorious about — when I get stuck on a pattern, can’t figure it out or just want to work on something else–I dig through a large bag of bags of unfinished pieces. Maybe not a good habit, but seems to work for me! In my defense, though, sometimes I am tired or riding in the car and need something easy to work on. I save the harder projects for when I am rested and can concentrate better. I have multiples so I can keep the hook with the project. I have several projects going at any given time, and never would be able to remember what size I started it with. I have two of Grandma’s hooks, off white in color. No markings of any sort, it is possible to find out if they are bone, ivory or an early plastic? At least a hundred,I’ve been crocheting off and on for over 30 years. Gosh I havent counted mine in ages. I dont have very many doubles so I am very careful with mine that I dont lose any. I do have double H hooks cause I use that one alot although I have found myself using my D and E more now that I am doing more amigurumi. I have one of almost every size (in metal except for the bigger ones that only seem to come in plastic) plus several extra G hooks. G seems to be used for almost everything and I too tend to leave them in project bags with my UFOs and then forget and have to buy another one. My husband doesn’t get it but it is nice to know I am not alone after reading the other comments on this post! I have 44 crochet hooks. I started out with 1 from my grandma and snowballed from there, but now that I am running a business I had to invest in ALOT more. I love getting new hooks. As I got better, I noticed I needed more hooks! I also got the Addi 5 mm bamboo crochet hook for my birthday and the 3 mm Clover Soft Touch. The latter one is one of my favourites. 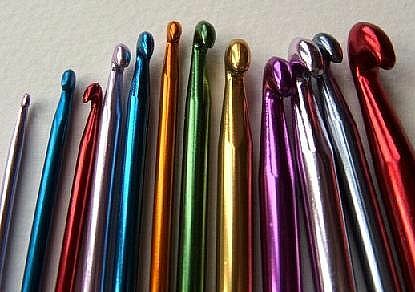 On my wish list: a full set of aluminium crochet hooks in the smaller sizes and some extra Clover Soft Touch hooks. My favorites are ones with clay polymer handles with flowers & butterflies in the design. They’re Bates hooks wearing a fancy wrapper! Reduces hand fatigue and makes them a lot more comfortable to hold. I have I guess about 75 crochet hooks or more. I have a habit of buying them at garage sales, swap meets, and thrift stores, if they are at a good price. Then I have family members that know I crochet and give me some that belonged to other family members that have passed away. I keep them because you just never know who might need that size J hook of which you have 7 of. I am a crochet hook hoarder! and I love it. I am a baby crochet addict. I just have 8 hooks-all aluminum so far. But, I found the best way to store them. My brother in law is a cigar smoker. His cigars come in a nifty glass tube. I put one hook in each tube and put a label at the end of the tube and place them in a jar. Very easy to keep track of. I even put the name of the project on a piece of paper and slip into the tube in case I have to stop in the middle of a project. I have about 15, but 3 of them are size N, 4 of them are size F, 2 are really bent, and 2 are the really small numbered ones that I don’t have yarn that I can use them for right now. 32. But that includes one cro-hook, and three afghan hooks in various lengths. And it seems like with every new project I need yet another hook! I have about 13-14 hooks, ranging from 1.80mm to 6.5mm. There is no such thing as too many hooks! I love them! Always not enough…since I tend to lost it and buy another then there are always more than one crochet project going on at the same time…I just easily get bored if one project take a long time to complete. At present I have almost 15 crochet hooks which some of them with the same size…. anyway I’m getting a new set of 12 aluminum hook just like in the picture above…and this will be my last hook shopping. I will be more organised this time. When I started out, I bought an inexpensive set of Boye aluminum hooks. If i remember correctly, it was one each of sizes D-N, and added from there. I would just buy whatever the local craft store had on sale or clearance. My collection is about 25 hooks in various sizes and materials. I came to realize I strongly prefer working with wooden hooks with a flat side, like the Susan Bates brand has. Recently, I purchased a few lacquered ebony hooks in the three sizes and style I use most often. They were a bit pricey but are a dream to work with, and seem sturdier than bamboo. They are also longer than any of the other hooks I own by about 3/4″, and fit my slightly large hands perfectly. To anyone starting out, I say get yourself a set of aluminum hooks in at least sizes D through L and experiment from there! As far as what you NEED, that varies depending on what you like to make. I almost never touch my tiny little steel hooks, but get tons of use out of sizes I, L and P. You need only what you will actually use. I have at least 20 aluminum individual hooks, plus one set of aluminum and plastic, plus one set of Denise extendable hooks and a couple of plastic ones when I could not find the size in aluminum. Many of my hooks are duplicates, and I almost always buy the same brand so if I have to, I can change if I misplace the one I am using or I can store it with the project if I decide to set it aside and start another one. My g’niece loves the sound of the aluminum ones clinking together (she’s too young to crochet for real, but I plan to teach her to chain at Christmas), so I let her play with them to get comfortable around them. I always try to keep about 3 of each size hook. When I am working on multiple projects I like to put the hook into the project when ever I put it down for a while. I had set aside an afghan in the past and used a smaller hook when I went back to it and ended up having to pull out several rows and re-do them. I much rather just keep them together so I don’t repeat that mistake again. And naturally we all loose those little things from time to time. I am still wondering where my G hook ended up in the living room over a year ago, there just wasn’t any where for it to hide where I was using it????? Then there was one that showed up in one of my husbands shoes when he went to put it on…..hah! Don’t know how that happened. My motto is the more the better. My g’niece (she’s 4, still too young to hold a hook properly) likes the tinkling sound of the aluminum ones when she plays with them, so I count them every once in a while – I have over 30 hooks, 3 each of 3.75mm, 5.5 and 5.00; two each of 3.5, 6.0, 4.25 and one of just about everything else. Oops, I forgot my interchangeable hooks (by Denise). Let’s just say that I have lots! I bet I have around 50 to 100 hooks. I collet them from all countries. Tulip, Addi, Clover and so on. You can’t resist when you find them at thrift stores or garage sales. Even the dollar stores have them at times. I have aluminium, plastic, acrylic, wood and some custom made. i am so glad to find this post even though many years has past. I picked up crochet again after more than 30 yrs and I was totally amazed with the assortments of hooks. Now I am more crazy about hooks than crocheting itself also yarns of great varieties…..after reading all the comments, I am so happy to hear that most crocheter have more than 6 hooks….because I am beginning to collect hook sets now. THank you crocheters!! I have been unwell with depression and found nothing motivated or inspired me to do much i seem to do what i have to do until i realize i love crocheting and reading the comments here! really cheers me up as i thought there isn’t much excitement left in me until i look at a crochet hook and i too seem to be collecting a stash lol. I have really enjoyed this blog thank you for sharing!. I find it funny that they take away your blunt crochet hooks on the plane but they let me keep my sharp pointy loom picks! (I’ve accidentally poked a small hole in my finger with one before.) Lol weird stuff. Then I have a tendancy to pick them up at garage sales, second hand stores, auctions, or give away sites on the web. And of course people give me ones that they no longer want…….. When my husband sees new hooks and wishes to comment, I just say “tools” and the discussion is over! Lol. Then there are knitting needless and yarns…..lets not even go there! I would say one at a time. Have a collection. How many do I have??? Well….I can physically locate about about 40 – 45. And I am pretty sure I have lost about 25 or 30 down in my chair! It has a closed bottom, so it would be a real PROJECT to retrieve them…so I kind of consider that to be a “Crochet Hook Burial Plot”!! I’ve lost count. Like Laura, I inherited all of my grandmother’s steel thread hooks and my mom’s Boyle and Susan Bates aluminum and plastic hooks. I have some of each in my own collection plus my favorite set of the original lCover hooks with the caramel color handles with some doubles. They all come in handy! I have bought several of each of the Boye hooks I use the most. Then I got a set of Susan Bates while I was in that phase. Back to Boyes now. And starting to buy the hooks with soft handles. Great for my arthritic hands. My biggest problem is sticking the hook into my yarn when I put my work down. Then I start a different project, and forget about the hook. Therefore, I have to buy more hooks!